With just one treatment, Cellulaze is the first FDA approved minimally invasive cellulite reduction procedure that attacks cellulite from within and not just on a superficial level. According to the National Center for Health Statistics of the Center for Disease Control and Prevention, over 60% of women are considered overweight or obese. It is also estimated that at least 80% of all women have cellulite - which means not only do overweight women suffer from cellulite, even the thinnest and fittest of women have to put up with the dimpled, orange-rind appearance on the buttocks and thighs. Or do they? With such a large demand for cellulite reduction, it is no surprise that this industry has boomed with lotions, creams, gels, and even professional aesthetic treatments that promise smoother, cellulite-free skin. There is no cure for cellulite and any treatment, professional or otherwise, can only reduce of the appearance of cellulite, not get rid of it forever. Cellulaze, the first of its kind, is the only minimally invasive FDA approved procedure to reduce cellulite in just one treatment. 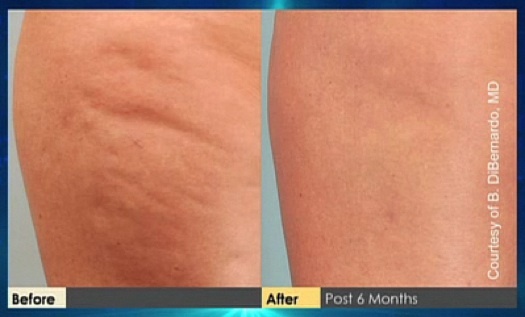 As recently seen on The Doctors, Cellulaze works by attacking the anatomy of cellulite. According to plastic surgeon Dr. Christine Petti, during the Cellulaze procedure, the energy emitted through the SideLight laser fiber breaks up the connective tissues beneath the skin, which may be responsible for the lumpy appearance of cellulite. To understand how Cellulaze is effective, one must understand how cellulite forms. It is speculated that the appearance of cellulite is a combination of several factors: thinning skin, connective tissue that is failing at keeping fat contained and bulging fat the breaks through the bands of connective tissue. Unlike other aesthetic cellulite reduction treatments, such as VelaShape or Smoothshapes, which usually combine massage and suction to externally treat cellulite on a superficial level, Cellulaze is a minimally invasive procedure that goes beneath the skin to address the actual structure of cellulite from within. "We are very excited to now offer Celulaze," announces triple board certified Denver plastic surgeon Dr. David Broadway who offers Cellulaze in Denver, "We have been looking for a real option for patients with cellulite for years. To finally have an answer is gratifying." From the makers of Smartlipo, a liposuction alternative which uses laser energy to disrupt fat, Cellulaze works in a similar fashion. An extremely small cannula with the SideLight laser fiber is inserted into a small incision made in the treatment area. Laser energy emitted through the SideLight fiber is visible from above the skin so the physician can clearly see the area being treated. The laser breaks up the connective tissues or fibrous bands that may be pulling the fat down, releasing fat from its lumpy appearance. The procedure may be performed in approximately 1-2 hours, depending on the severity of the cellulite. Clinical research has shown that Cellulaze increases two key components in skin: collagen and elastin. Not only does the laser break up the fibrous bands that essentially pull down on fat - which creates the dimpled appearance - Cellulaze has also shown a 25% increase in collagen in the treated area, resulting in thicker skin, which in turn also minimizes the appearance of cellulite. The procedure has also shown a 29% increase in elastin, which improves the smoothness and elasticity of skin. Also unique to Cellulaze, only one treatment is needed to see results, unlike the series of treatments recommended with other cellulite reduction devices. According to the manufacturer, patients can expect to pay between $5,000 and $7,000 for the procedure, depending on the size of the area being treated as well as the geological market of where the procedure is being performed. Results may be seen immediately but will continue to improve over the next 3-12 months, leaving patients cellulite-free for up to a year or more. American Health and Beauty's Beauty Tech Review on Cellulite Reduction offers a comprehensive overview on other cellulite reduction treatments.